With the Super GT season starting in just two weeks’ time, pre-season testing is in full swing. The preparations for the introduction of Maserati to the domestic ranks have presented the opportunity for some fascinating comparisons between the MC12 and the leading GT1 racer from an ever so slightly earlier era. Whilst the Team Goh MC12 tested only on the longer configuration of the Vallelunga circuit before being shipped out to Japan, circuit sources were prompted to recall some interesting statistics. With the original MC12 being prepared to hit the tracks in 2004, Mika Salo produced a best lap of 69 seconds on the short circuit at Vallelunga. That compared very favourably indeed to the best time set back in 1998 by a Mercedes CLK-GTR, with 1999 updates, pedalled by Mark Webber, who set a best of 68 seconds in a car rightly regarded way back then as the cream of the GT1 crop. 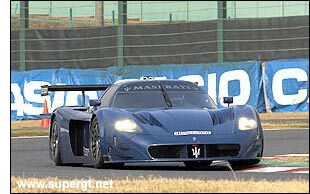 Remember of course that in 1998 terms the MC12 is a GT2 machine! There is a similarly interesting comparison to be made between the Super GT spec car being shaken down for Team Goh on the long circuit and the FIA GT spec car when it tested on the same track configuration. The FIA car with Pirelli rubber and the narrower wing set a best of 1:30.9, while the Team Goh-run Super GT spec. car, on Bridgestone rubber, set a best time an astonishing 2.8 seconds faster. That's a telling difference, but it is unlikely to be enough for the big Maserati to trouble the factory backed Nissan, Honda and Lexus cars in GT500. Kazumichi Goh had set the team a target of being a full 5 seconds faster than the FIA spec car if they were to take the fight to their Japanese competition, and there is still work to be done in order to close the gap. The first Suzuka test with the Goh car saw that point of view very firmly endorsed, Seiji Ara posting a best effort of 1:55 in the Maserati, which compares unfavourably to the best posted by a team running one of the Nissan Fairlady Z GT500 racers - with a 1:52.4. Perhaps more ominously still, sources suggest that a new spec. Honda NSX has posted a lap in an astonishing 1:51.6. Putting that in perspective it matches the pole time set by the Team Goh Audi R8 at the Suzuka 1000kms in 2001! The pace of improvement in the GT500 cars is remarkable: the leading cars are now 2-3 seconds per lap faster than 4-5 years ago. Mr Goh though is not downhearted: "I think we can find most of the difference. There is a little bit of work that can be done on aero with the rear gurney and a deck gurney and by modifying the dive planes a little. What we do have though is a very good car in the rain." The work continued this week at T.I Aida but progress was slowed for Team Goh with an oil cooler failure, possibly linked to a minor vibration problem, or perhaps because the Italian thoroughbred responded badly to the almost freezing weather conditions. Japanese customs officials haven't helped matters either, with a 3-4 day delay in the import procedure for the oil supply for the car. A phone call to the Maserati importer revealed that the standard spec. of lubrication for the Ferrari Enzo, which of course shares the MC12’s basic DNA, would suffice. You’ll be reading much, much more on the Super GT season to come here on dsc.